The Chitananda Tantra Meditation Retreat on Orcas Island, Washington April 2013. You may read and even copy this document for your own personal use. But it may not be shared or posted in any media for any and all reasons without the written permission of the author. Chitananda Tantra is my own personal synthesis of various tantric methods and philosophies drawing from multiple sources including BonPo Shamanism, Tibetan Buddhism, as well as various forms of yoga from ancient India and Daoism (Taosim). This path of self-liberation is a non-dogmatic and non-hierarchic system of self-inquiry into the nature of your own Mind (i.e., Consciousness). There are no gurus within this system. The sole focus of this tantra is the cultivation of your own bodhicitta (Enlightened Mind) and your own self-liberation by integration of the practices of this tantra into your daily life. The View, meaning the philosophical underpinnings, as well as the meditations that comprise Chitananda Tantra, are a result of my explorations into various forms of tantra (meaning energy practices of the Mind). This personal work has spanned the course of many years, and I was greatly aided in this endeavor by the Tibetan tutelary being, White Tara. White Tara is sometimes referred to as The Goddess of Compassion and also as The Swift Protectress—since she protects tantric practitioners from the samsaric delusion of duality. She is sattvic (meaning pure and nurturing), and her emanations are highly auspicious, healing and liberating. White Tara is engaged as a protector and ally in this form of tantra, because her benevolent emanations greatly assist practitioners on the path to rapid self-liberation. She is not, however, a deity to be worshipped. Indeed, within this stream of tantra there are no beings to be worshipped. This workshop is the first time I have publicly presented this form of tantra, and as such, it is the First Turning of the Wheel—a term meaning when a teaching is first presented. The only acknowledged divine guru within Chitanada Tantra is your own innate guru within. While you can certainly receive valuable instructions and insights from Rinpoches (teachers) and other practitioners, your task is to purify your own perception and mental habits so that you perceive your own inner guru with greater clarity. Chitananda Tantra is, first and foremost, a method for penetrating and residing within the inherent bliss of pure consciousness. The term is derived from two root Sanskrit words—chit, meaning knowledge and ananda, meaning bliss. This form of tantra imparts practical knowledge regarding how you can make contact with your own inherent blissful nature, integrate this into your daily life and use it as a springboard to attain illumination and Enlightenment. Chitananda Tantra progresses through an interaction of five tantric meditations, or direct inquiries, into the nature of your own Mind (i.e., Consciousness). These meditations will be described later in this document, but in terms of attaining the deepest insights of Chitananda Tantra, the most important stage is a meditation that conjoins emptiness and bliss. The Double Dorje is sometimes used as a symbol (in Tibetan Buddhism) to represent enlightenment through the union of emptiness and bliss. The contemplation of emptiness means to be directly aware that the nature of all phenomena, including your body, is essentially empty. This is sometimes referred to as the wisdom of emptiness, or the Prajnaparmita (the Mother of All Buddhas). Conjoining the wisdom of emptiness with the serenity of bliss generates potent states of awareness and deep insight. The purpose for attaining these states of Enlightened Mind is to transcend the samsaric delusion that you are limited by the circumstances of your life and to free your Bodhicitta (Buddha nature) from the entanglements of samsaric perception. Freeing your Bodhicitta from the entanglements of samsaric (or dualistic) perception allows you to move through the world as a benevolent influence with ever increasing spiritual mastery. Another benefit of freeing your Bodhicitta from dualistic perception centers around your experience of death. For those who have attained a high level of Enlightened Mind, death becomes moksha or final liberation from dualistic perception through the agency of Mahasamadhi (Great Samadhi) whereby the practitioner remains conscious through both the death process and the intervening Bardos (or after-death states of existence). In a very advanced stage of illumination and Enlightenment the physical body is transformed into its original nature as light at the moment of “death.” This process is called the Rainbow Body in Tibetan Buddhism, and it occurs when the Five Pure Lights that comprise the physical body are liberated and return to their true unobstructed nature—the Clear White Light. The Five Pure Lights are central both to the Dzogchen teachings of the BonPo (Tibetan Shamanism) and Tibetan Buddhism. According to this view, the deluded believe the world of matter to be intrinsically real, but this is due to the fact that they do not perceive the Five Pure Lights directly. The Five Pure Lights are the underlying reality behind matter, and they are related to the classical elements of space, air, water, fire and air. When a being apprehends the true nature of the Five Pure Lights, he or she enters rigpa (the absence of delusion), and in the advanced stages of this understanding he or she attains the Rainbow Body. Another way to view the Five Pure Lights is through the lens of the three kayas (or realms). The physical world is called the Nirmanakaya or the realm of emanations. The world of matter is generated by quantum fluctuations that create sub-atomic particles, atoms, molecules, etc., all of which are emanations from more subtle realms of existence. At a subtler level than the Nirmanakaya is the Sambhogakaya—the realm of pure light and sound. It is here where the Five Pure Lights reside. As consciousness becomes more refined it can apprehend the more subtle play of the Five Pure Lights at this level of existence. As consciousness refines further, it reaches a point where it apprehends itself as pure unobstructed awareness or the Dhamakaya—the realm of pure consciousness. This is the realm of the Buddhas and pure consciousness itself. It is at this level of subtlety that the Five Pure Lights return to their original source—the Clear White Light. Chitananda Tantra views all three realms—the Nirmanakaya, the Sambhogakaya and the Dharmakaya—as one continuum of consciousness. In other words, your physical body is a temporary and transitory display of emanations in the Nirmanakaya, which has its roots in the realm of pure light and sound (the Sambhogakaya). This realm of light and sound is, in turn, rooted in the realm of pure consciousness (the Dharmakaya). Your body and the world of matter are expressions of the Five Pure Lights and the Five Pure Lights are an expression of pure consciousness itself, also known as the Clear White Light. Human beings have the potential (through their own innate Bodhicitta) to be aware of, and operate from, all three realms simultaneously. From this perspective, the five meditations that comprise Chitananda Tantra are a means to attain this goal. Indeed, these five meditations are designed to orchestrate awareness so that eventually you will attain rigpa (absence of delusion) and recognize your true nature as a triune force of Emptiness conjoined with Bliss and Light (i.e., the Five Pure Lights). This tantra requires the practitioner to accept The Niyama of Ethical Constraint. The purpose of this constraint is to protect the practitioner from misusing the lesser and greater siddhis (or powers of consciousness), which will spontaneously arise if he or she continues to engage and work with the tantra on a regular basis. From the perspective of Buddhism, Chitananda Tantra is fundamentally a Hinayana practice—the goal of which is individual illumination and Enlightenment. From this view each of us is responsible for our own evolution, and everyone else is responsible for his or her own evolution. In other words, you are not responsible for anyone else’s happiness, and no one else is responsible for yours. The path of Hinayana (or the Lesser Vessel) is in contrast to Mahayana (the Greater Vessel), which works for the illumination and Enlightenment of all sentient beings. A Mahayana practitioner engages all meditations and tantric ceremonies for the benefit of others. While a Hinayana practitioner can have Mahayana inclinations, he or she is clear that the goal of his or her practice is personal illumination and Enlightenment. For such a practitioner, the Niyama of Ethical Constraint is an indispensable ethical requirement. The Niyama of Ethical Constraint is not a “vow,” rather it is an intention. If and when you violate your stated intention by harming yourself or another, you do not resort to shame or guilt. Rather you enter into a state of personal inquiry—exactly why did you harm yourself or another person? This form of inquiry is far more resourceful than self-indulgence in shame, guilt and self-condemnation. The Niyama can be engaged in several ways. The most common is to state it silently to yourself after working with one of the tantric meditations. In its simplest form, the Niyama is stated as…For the sake of my own elevation and the elevation of all life, I shall strive to be harmless to myself and others. If you are a Mahayana Buddhist, this Niyama still applies. You may, however, wish to modify it as follows… For the sake of my own elevation and the elevation of all life, I shall strive to be harmless to myself and others. May the benefits of this meditation extend to all sentient beings. Chitananda Tantra is comprised of five tantric meditations. Each of these meditations is crucial to the success of this tantra, because each meditation develops a different capacity of your Mind (i.e., Consciousness). While the meditations are numbered for ease of communicating, you can combine the meditations in any order you wish. You can also devote more time to those meditations you feel drawn to, so long as you spend some time with each of them. Bodhicitta is self-revealing in states of mental quiescence. This first meditation quiets the mind, even for those who have very active talking minds. The meditation is a Daoist (Taoist) technique called The Celestial or Heavenly Gate. It is highly effective and has the added benefit of being a superb stress reducer. Beginners may wish to start with just five minutes and then slowly work up to longer sessions. This single meditation will yield immense benefits and is well worth the time and effort involved to master. The meditation is based on Dragon Points, which are areas of convergence where one form of chi meets another. There are several Dragon Points within the human body. The Celestial Gate is just one of these, and it happens to be a place where heavenly chi (a very subtle form of chi) flows into the body and meets terrestrial (or earthly) chi. This area is energetically charged and profoundly alters awareness when it is focused upon. To engage the meditation, sit comfortably and close your eyes. You can lie down if you wish, but this makes some people go to sleep. For a moment just notice your breath. Don’t change it in any way; just watch it. Notice the rhythm and the depth of your breath. Then after a moment become aware of a space about an inch (or 2cm) behind the bridge of your nose. Imagine that this space is also about an inch square. This is the Celestial Gate. All you do is focus you attention in this area. Do not concentrate. Just be aware of this area. If you are having thoughts or fantasies, this is not a problem. Let them continue on their “merry way.” Just let some part of your attention be on the Gate. You can think about anything you want, and as much as you want, so long as some part of your attention is on the Gate. As you continue to focus at the Gate, you will notice that your thoughts eventually seem to slow down. After a while there will be more space between your thoughts. And eventually they will stop altogether, if only temporarily. During these moments you might find that your breath has stopped or has become very shallow. This is natural and is, in fact, a sign that you are entering deeper states of stillness. It is these deepest states of quiescence—where there is no breath and no thought—that clear unobstructed contact with your Bodhicitta is often revealed. This is the foundation meditation for Chitananda Tantra. 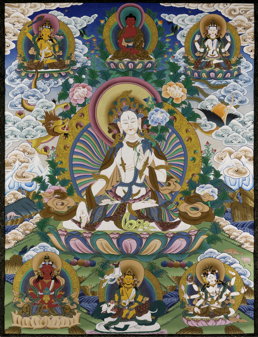 Liberation through the cultivation of Intrinsic Awareness, was described by the tantric master, Padmasambhava (Guru Rinpoche), who introduced Buddhism to Tibet in the seventh century. Intrinsic Awareness is, quite simply, the awareness of being aware. It is nothing more than ordinary everyday self-awareness. However, this tiny non-descript form of innate awareness can blossom into an extraordinary attainment—if cultivated properly. As your ability to be self-aware in multiple situations grows, you will be able to remain “conscious” even in difficult and obscure conditions such as emotional conflicts, sleep states and, in its most developed form, you will be able to remain “conscious” during death as well as when you transit through the after-death states of existence (i.e., the Bardos). This is an active meditation—meaning that you practice it in the midst of your everyday activities. Every situation and every mental/emotional condition is an opportunity to cultivate (i.e., increase) your Intrinsic Awareness. This active meditation eventually generates a mental state called Mindfulness, which leads to deeper insights regarding the nature of your own mind and its relationship to the phenomenal world. To engage this meditation, you simply become aware that you are aware while doing whatever it is you are doing. It is that simple. But don’t let its simplicity fool you. This is a potent catalyst for the liberation of your innate Bodhicitta. The more often you engage this meditation the greater will be your progress. This is the third Chitananda Tantra meditation, and its purpose is to purify deep-seated negativity. It accomplishes this task by engaging a tantric diamond (called the Bodhi Diamond) created from your own Bodhicitta. The Bodhi Diamond is created in your mind during a High Tantric Ritual with White Tara, who empowers the tantric diamond with sattvic (i.e., healing and nurturing) white light. It is important to understand that the Bodhi Diamond is drawn from your own Bodhicitta during the Tantric Empowerment. And it is thus your own Bodhicitta (Enlightened Mind) that is the root from which the Bodhi Diamond is created. White Tara simply clears away hindrances that might prevent the formation of the Bodhi Diamond and empowers this unique tantric diamond with gentle healing and nurturing energies. This meditation has four phases, and you can choose any phase you wish to work with. Generally speaking, you would work with only one phase during a session due to its potency, although if you are keenly motivated and are prepared for the possibility of increased psycho-spiritual detoxification you could go through all four phases in one meditation. It is suggested that you keep your beginning meditations in a range from five to ten minutes so that you become accustomed to how the diamond’s subtle energies interact with you. Although you will, no doubt, have a favorite phase, it is good to periodically work with all four phases. The Bodhi Diamond resides in the center of your head emanating a white light. After establishing the Diamond in your head via your imagination, also become aware of your heart chakra in the center of your chest. Through the power of your intention, allow the Bodhi Diamond to send its emanations of sattvic light down into your heart chakra and allow this light to eventually expand to include your physical heart as well. This phase purifies suppressed sadness, grief and regrets that are held in the heart region. As in the first phase, you imagine the Bodhi Diamond in the center of your head. After establishing the Diamond via your imagination, also become aware of your liver, which extends from your diaphragm down the right side of your abdomen. Through the power of your intention, allow the Bodhi Diamond to send its emanations of sattvic light into your liver where it transforms and purifies suppressed anger, hatred and resentment. Just as with the two previous phases, you imagine the Bodhi Diamond in the center of your head. After you have a clear sense of the diamond, also become aware of your kidneys, which are about the size of your fists and sit tucked up behind the lower back ribs to the right and left sides of your spine. Through the power of your intention, allow the Bodhi Diamond to send its emanations of sattvic light into your kidneys where it transforms and purifies suppressed fear and anxiety. After establishing the Bodhi Diamond in the center of your head, you also become aware of your entire body. Hold the realization that your physical body is a manifestation of The Five Pure Lights. By allowing the Bodhi Diamond to send its emanations of sattvic light throughout every cell of your body, you transform and purify suppressed cellular memory, and you nourish the Sambhogakaya (light realms) of your being. After you have established the sense that your body is an expression of the Five Pure Lights, align the Diamond so that its point is directed downward (if it isn’t already aligned this way). Allow the sattvic white light to stream down into your Secret Channel, which runs down through the center of your body to your perineum. This final phase purifies your Secret Channel and its subtle perceptual potentials—i.e., by affecting the subtle winds (the loong/lung element). When you are complete with the arising of bliss, it would be an ideal time—if you have the time to spare—to shift into The Double Dorje of Conjoined Bliss and Emptiness (The Fourth Meditation). This is because the union of bliss and the perception of Emptiness is the foundation meditation for this tantra. Whenever bliss arises, wherever and whenever it occurs, it is an ideal time for you to conjoin it with an awareness of Emptiness. Each time you engage the Bodhi Diamond you will, most likely, have a different experience from previous meditations. This is because the Bodhi Diamond cycles through various levels of negativity, hindrances and obstacles. At times the meditation will result in bliss or ecstasy, at other times you could experience painful memories, emotions and/or unpleasant physical sensations. If an experience becomes too intense for your comfort zone, end the meditation and lie down if possible to rest for a while. In this work, you are the arbitrator of how fast or slow you move through your own negativity. It is important to understand that in Chitananda Tantra, the purification of your own negativity is a necessary tantric action. Without purification and transformation of deep-seated negativity, you cannot sustain the higher vibratory expressions of your own Enlightened Mind (i.e., Bodhicitta). The union of bliss with an awareness of emptiness generates states of deep insight regarding the nature of consciousness and matter. The repetition of this union between bliss and emptiness will (over time) eventually lead to Enlightenment itself—Enlightenment being defined as a direct experience of yourself as pure consciousness that is transcendent to perceived time, space and circumstance. There are two phases to this meditation—1) the generation of bliss and 2) the contemplation of Emptiness while residing in blissful states of awareness. Place your awareness in your heart chakra and/or physical heart. While focusing your attention in this area, recall the actual feeling (i.e., emotion) of appreciation. If you continue holding the coherent emotion of appreciation while focused in your heart area, you will eventually begin to experience a spontaneous arising of bliss. As you become more familiar with this method, you will be able to generate blissful states quite rapidly, and you will be able to amplify the intensity of this bliss by repeatedly reinforcing the feeling of appreciation in your heart chakra and/or physical heart once the blissful feelings start to arise. Once you have attained a continuous feeling of bliss, you are ready to conjoin it with an awareness of Emptiness. You can enter this stage of the meditation sitting up or lying down, but if you lie down you will need to avoid the temptation to go to sleep since this stage produces a profound altered state of awareness. The first step is to enter into the feeling of Spaciousness. To accomplish this, imagine yourself surrounded by a large immense space. It is important to feel this sense of imaginary space rather than just think about it. Feeling the imagined space will activate the spatial intelligence of your right cerebral hemisphere and will produce a more profound altered state. The next step, as you reside in this feeling of Spaciousnsess, is to mentally realize that all matter is comprised mostly of space—including your body. It has been estimated that your physical body is comprised of approximately 99 percent space (+/-). In fact, if you removed all the actual space from your body and put the remaining physical matter in a pile (i.e., the subatomic particles that comprise the matter of your body) it would all fit on the tip of a pin! Thus, in a very real sense, your body and the world are comprised primarily of Emptiness. While contemplating this fact, imagine that you can actually sense the space between the subatomic particles of your body as well as the space between the subatomic particles of everything around you. As you enter this imaginal state you will experience a subtle shift in perception. The best way to describe this shift is a kind of floaty feeling. Next, you rest in the awareness that all is Emptiness while residing in bliss. Hold the two together—the feelings of bliss and the perception of Emptiness. If your mind wanders bring it back to the union of the two. Don’t worry if the sense of bliss subsides. Just return your focus to your heart chakra and/or physical heart while holding the feeling of appreciation. When the feeling of bliss returns, return to the perception of Emptiness and hold the two together—bliss conjoined with Emptiness. In the learning phase of this meditation, it is suggested that you limit your sessions to between five and ten minutes. As you become more familiar with the experience you can extend the time. At the beginning, when you are learning how to conjoin bliss and Emptiness, it can be spatially disorienting especially if you hold the union of these two for long periods. Thus, it is strongly suggested that you rest for a bit before entering outer activities after this meditation. This meditation unifies, within your own perception, the three realms—the Nirmanakaya, the realm of emanations (i.e., your body and the world of matter) with the Sambhogakaya, the realm of pure light and sound (i.e., the Five Pure Lights) and the Dharmakaya, the realm of pure consciousness. This unification of the three realms is central to Chitananda Tanra. One cumulative effect of this meditation is that separation between you, the Five Lights and Pure Consciousness is diminished. Sitting in a comfortable position, place your awareness in the region of your crown lotus (the Sahasrara) at the top of you head. Imagine a white lotus flower opened at the top of your head with its stalk passing down the central line of your body, through The Secret Channel, to your perineum. Imagine that your Sambhogakaya body is luminous white. This body is the same size and shape as your physical body but is comprised of pure light. Once you have established a sense of this luminous body, enter Spaciousness by recalling the feeling (not the thought) of being surrounded by a large space. This activation of kinesthetic memory through the recollection of a spatial feeling will activate the spatial intelligence of your right cerebral hemisphere. When you have attained a strong sense of being surrounded by, or even floating in space, spend a few moments being aware of this spacious feeling and your luminous body. Then become aware of your physical body as you hold awareness of the other two realms. The final stage of this meditation involves focusing part of your mental attention on the white crown lotus at the top of your head while simultaneously being aware of Spaciousness along with your luminous body and your physical body—all at the same time. As you hold these three perceptual realms together, you silently repeat to yourself a statement of perception that describes the experience of samsara from the perspective of your liberated Bodhicitta. The reason for repeating this phrase, while focused on the white lotus at your crown chakra and joining the three realms together in your mental awareness, is to impress the idea into your “mind,” so that you recognize this shift in perception more easily when it arises of its own accord in the course of this tantra. It is important to recognize that the statement of perception describes a view that is attained only by your Enlightened Mind when it has integrated the experience of samsaric duality. This view appears dream-like in nature and occurs when all phenomena of the Nirmanakaya are experienced as essentially empty (Emptiness). From this perspective the solid world of matter is seen as illusory in nature and the true nature of consciousness is experienced as both self-luminous and self-liberating. By nature self-luminous and self-liberating. First of all, some basic concepts would be helpful before proceeding. Mandalas are painted geometric patterns that are related to forces or aspects of consciousness. They are used extensively in certain types of Buddhist and yogic meditation. A typical mandala has a center and four directions. Depending upon the type of mandala—the central figure(s) may be separate from the outer spaces of the mandala or may be emanating (sending energy) into the outer spaces of the mandala. In this practice, The Mandala refers to all of the phenomena that are occurring in the universe at this moment. You are at the center of the mandala that is your life, because it is from your personal perspective that you experience the world. In turn, each person around us of us is also at the center of his or her mandala. As a result none of us experience the world in exactly the same way because our centers (our personal sensory perception and ways of being) are different. Tantric yogis and yoginis (female yogis) view this in somewhat different ways depending upon the lineage they are working in, but essentially they would agree that our experience of the external world is a result of subtle energies within our nervous systems. In other words, the world does indeed exist independently of us, and our mental/emotional experience. But how we experience that world is a result of how we personally internalize it through our senses. According to Buddhist tantra, at the moment of death these subtle energies of consciousness, called lung (loong) in the Tibetan language, or subtle wind element in English, dissolve, and with them our experience of the world disappears as well. Lung is not the same as breath, but rather refers to the movement of life-energy through minute energetic channels in our subtle bodies (called nadis). Taoists call this type of subtle energy chi, while yogis refer to it as prana. The practice of The Mandala of Great Compassion is based upon the understanding that in any given moment, innumerable beings are suffering. Suffering—from the perspective of Buddhist tantra—is a result of attachment to sensory experience. Thus, when someone feels a loss as experienced through his or her senses, there is suffering. This practice is based upon the understanding that suffering is inescapable. And so tantric practitioners do not seek to end suffering, but to transform the roots of suffering within their own consciousness (called Mind in Buddhism). If he or she can assist another being to avoid suffering, he or she may undertake to do so. And certainly, in moments of personal suffering he or she would do what could be done to alleviate it. But whatever actions are taken for self or others takes place within a specific context—the knowledge that all beings suffer as a result of being in samsara—the illusion of relative existence in the physical world. The task of a tantric practitioner, then, is to transform his or her own negativities so that the bliss of nirvana is realized in the midst of samsara. There is, from my experience, a lot of confusion about the terms nirvana and samsara. Part of this confusion arises, no doubt, from what stream of Buddhism we are talking about. Some lineages focus upon leaving this sensory world in order to experience the bliss of nirvana at death. Other lineages say that one can experience the bliss of nirvana in the midst of life, in the hot bed, if you will, of sensory-based samsara. They point out that nirvana is experienced whenever one is at the center point of consciousness. In fact, according to many yogic and tantric traditions, the center point of awareness, or one’s transcendent Self, is, by nature, bliss (ananda, in Sanskrit). Most people have to die in order to quell the sensory circus of life so that the bliss of nirvana can be even momentarily experienced. However, a tantric master can experience glimpses of nirvana whenever he or she enters deep meditation (Samadhi). But while experiencing bliss is an important benchmark for tantric practitioners, it is not the goal. Buddhist tantra deals with the realities of being in samsara. Its goal is nothing short of dissolving the illusions of samsara while in the midst of samsara itself. This is a Herculean achievement, and those who do so are called Tantric Heroes or Heroines in Buddhist lore. In moments of personal suffering, of any kind, including mental, emotional, spiritual or physical, it is an ideal time to practice The Mandala of Great Compassion. I say this because this practice imparts understanding as to the nature of your suffering, and it builds spiritual merit (or positive force). The beauty of this practice, then, is that merit is generated in the midst of one’s own suffering, and may also assist to decrease the suffering of others. I must digress here for a moment and talk about what I consider to be great misunderstandings about the nature of spiritual merit in spiritual communities in general and Buddhist sanghas in particular. True merit arises when we give spontaneously from the heart, or take a beneficial action with no thought or desire for personal reward. It is this spontaneous expression of bodhicitta (your innate Buddha mind) that generates merit. There is no Buddha in the heaven worlds with a little book marking when you do good things or bad things. Rather, positive actions strengthen one’s innate bodhicitta, and one of the results of this is that prajna or transcendent wisdom increases. In other words, we move closer to Enlightened Mind. Doing something good in order to get merit does, in fact, not build merit. It only perpetuates self-obsession, and in my experience there is nothing quite as distasteful as spiritual ego. Give me good old-fashioned ego, any day, over someone who is infested with self-righteousness. The practice does not require any particular type of posture, incense, prayers or even quiet time. I have done it while shopping for groceries and even while driving. Ideally it is done in the very searing heat of one’s own suffering—in the moment that it is happening. Place your awareness in the center of your chest, behind the sternum about midway between your chest and your spine. This is the location of your heart chakra, and it is from here that you generate the energies of Great Compassion. The mantra for this practice is that of the Buddha of Infinite Compassion, called Avalokiteshavara (in Sanskrit) or Chenrazig (in Tibetan). This Buddha has many forms, one of them having a thousand arms and a thousand hands, and in each hand is an eye that witnesses the suffering of beings in samsara. It is vital to understand that this Buddha figure is nothing less than your own highest spiritual nature. It is not separate from you, but rather it is an archetypal being that represents a quality inherent in your own being—compassion. According to tantric understanding, mantras carry the energy of the deity they correspond to, and the deity resides within the vibratory fields of the mantra itself. But deity in Buddhist tantra is different from the creator gods of other religions. These tantric deities are manifestations of powers or aspects of one’s own consciousness. By chanting the mantra silently, or out loud, you activate the residing deity of that mantra. The mantra used in this practice is Om Mani Peme Hum or Om Mani Padme Hum. You can also use Om Mani Peme Hung. All of these mean essentially the same thing—Hail To The Jewel In The Lotus. The jewel is compassion and the lotus is the heart chakra. Then simply focus your attention in your heart chakra. Breathe naturally and whenever you inhale, silently repeat the mantra so that you feel its subtle vibratory energy in the heart. As you exhale normally, you send the emanations of compassion from your heart out to all other sentient beings who, like you, are suffering in that moment. The reason for doing this practice is that it increases self-awareness around your personal suffering and builds spiritual merit by releasing a beneficent energy into the world. You do not need to be in suffering to do this practice. You can do it whenever you wish to send beneficial energies to sentient beings. But when you do find yourself in suffering, it changes both the quality and understanding of your suffering. Sometimes our personal suffering may be so intense that we cannot even muster the will to repeat the mantra. If this is the case, then simply send feelings of compassion out on your exhales into the Mandala of the Universe. And what exactly is compassion? In its root, it means to feel with. Thus when we feel compassion for other beings, we feel along with them. This is not the same as sympathy, which is feeling sorry for someone. Compassion recognizes that we all suffer, and when you extend compassion to another, you are a witness—nothing more and nothing less. And yet through the power of being a loving or caring witness for others, we somehow mysteriously help to transform our own suffering.